HONOLULU – The Hawaii Department of Transportation (HDOT) advises the traveling public that the Honolulu bound contraflow using the Kailua/Kaneohe bound lanes of Pali Highway will continue next week, Monday, Feb. 25 through Friday, March 1, 2019. Pali Highway between Castle Junction and Waokanaka Street will remain closed over the next two weekends as crews continue to remove loose material from the slope faces above the highway as well as debris and boulders from the highway. An update including proposed slope stabilization designs and a revised schedule for access using the Kailua/Kaneohe bound lanes is anticipated for the week of March 4. An updated diagram showing the contraflow entry and exit points is available by clicking here. Additionally, HDOT is asking hikers to avoid the Likeke Falls Hike below Pali Highway until further notice. Rock scaling operations, the dislodging of loose material from the slope face, will continue above Pali Highway over the weekend. Onsite observations show some of the material is continuing downslope of the highway towards the Koolau Golf Course and could pose a rockfall danger to those on the trail below the highway. 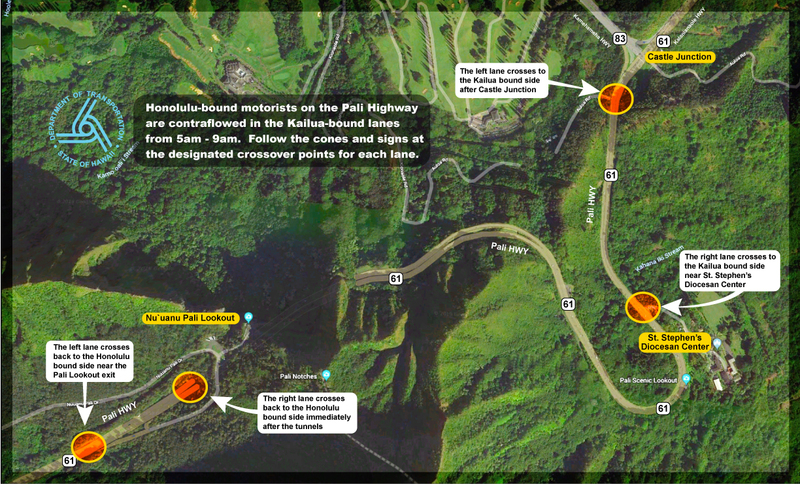 As a reminder, the Nuuanu Pali State Wayside (also known as the Pali Lookout) remains closed due to the closure of Pali Highway. Acting Governor Josh Green signed an emergency proclamation to expedite the emergency work on Pali Highway. A copy of the emergency proclamation may be viewed here. Two new photos taken of the area today are attached. Please courtesy “HDOT” or “Hawaii Department of Transportation” if they are published.